Ever since my daughter was little, she and I have played games together. iOS games, mainly, and to a lesser degree games on the Mac (although mostly just Minecraft, to be honest). She loves games, I love games, and it’s a great way to spend time together. However, we’ve never gotten a console for playing games on the big TV screen, so when Apple announced in September of 2015 that the upcoming 4th generation Apple TV was going to allow 3rd party apps, highlighting games as an example, we both jumped up and down on the couch a few times. Apple presented the world with a beautiful vision – an Apple TV as good as ever for watching video, and now capable of much, much more. The new Apple TV would support MFi game controllers, Metal, and Game Center (and third-party apps and an App Store, obviously). It sounded to me like Apple was promising proper game support, or at least close enough for people who didn’t plan on playing Halo or Doom. As soon as it became available, I threw money at Apple as fast as I could. We couldn’t wait to get one and get some Apple TV gameplay going. Then something strange happened: Apple punched everyone in the kidneys by deciding to require that all games support the Apple TV Siri Remote for play, regardless of whether or not they could be played using console-style game controllers. This crushed the ability for developers to make certain types of games for Apple TV. The design of the Siri Remote makes anything more complex than a simple side-scroller either impossible or really unsatisfying to play. The remote does have a motion sensor, but I’ve tried it with games like Real Racing, and it’s not good. It isn’t fun, and games that require a lot of buttons just aren’t possible on Apple TV if they also have to be playable using the remote. 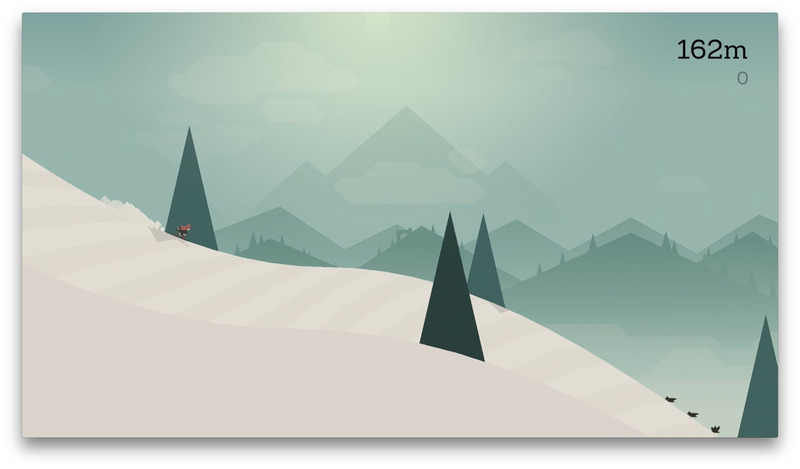 The only games I’ve actually enjoyed playing on Apple TV using the Siri remote are Crossy Road and Alto’s Adventure. I think my daughter has gotten through a bunch of levels in Rayman’s Adventure using the remote as well, but that’s basically another side-scroller. Even something as simple as Pac-Man 256 plays so much better with the steelseries Nimbus controller than with the Apple TV’s remote that it’s not even close. Real game controllers are a must. Alto’s Adventure on Apple TV is outstanding. This regrettable decision by Apple crippled the Apple TV game market for a long time. It’s not just that a several whole categories of games weren’t possible on Apple TV, this policy also seems to have sent a strong message to game developers not to take the Apple TV seriously in any way whatsoever. Big name games didn’t come to Apple TV, or if they did, the game developers treated them like an afterthought. A prime example of this attitude is a game we really got burned by: TellTale’s Minecraft Story Mode. Released as an episodic story game in early August 2015, TellTale published the game on several platforms including iOS, Android, Playstation, Xbox, Wii U, Windows, and OS X. TellTale then released an Apple TV version on August 24th as a separate app from the iOS version for iPhone and iPad. Because it’s distinct from the non-Apple TV iOS version, it has to be purchased for $4.99 again, and all of the episode In-App Purchases have to be made again. Unfortunately, the episodes available are only a subset of what’s available on other platforms. Minecraft Story Mode on Apple TV only has episodes 1-5 for purchase. Episodes 6-8, available on every other platform, are still completely missing. 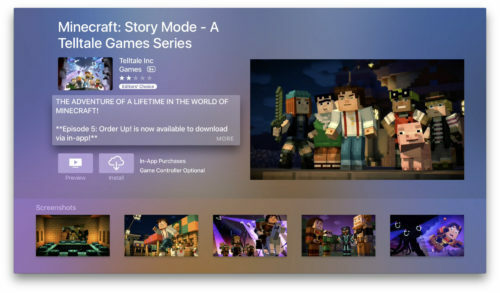 Minecraft Story Mode on Apple TV still only has the first 5 episodes available for purchase. TellTale doesn’t even acknowledge the existence of the Apple TV version of its game on their website. I found this out when I needed support because the game started hanging on launch. They did answer my request – it turns out you can’t be logged into iCloud on Apple TV for the game to finish launching, which is an inconvenient bug they still haven’t patched. Their last update was in October of 2015, and this is a bug they are fully aware of. Also, months later, they still don’t have Apple TV as a platform option for support requests. iPhone and iPad are the closest options. 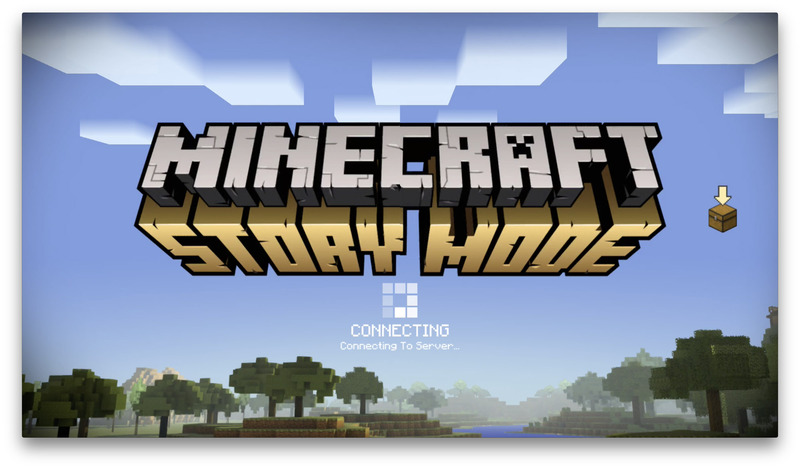 Minecraft Story Mode on Apple TV hangs on this screen if you have your Apple TV logged into iCloud. In the summer of 2016, Apple reversed course (some might say came to their senses) and decided to allow developers put games on Apple TV that require an external controller. 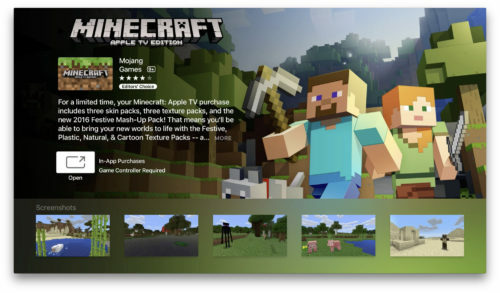 It is good news, and it can’t be a coincidence that Mojang released the real, original-style Minecraft for Apple TV just a few months later on December 19th. Minecraft is a perfect example of a game that needs those buttons and joysticks. It just wasn’t possible without a proper gaming controller. Minecraft Apple TV Edition is an amazing way to play Minecraft. The (currently) free Festive Mash-Up 2016 pack is worth the price of admission. Still, Mojang is following the lead of TellTale games in basically ignoring the fact that the Apple TV version exists on their support site. Support categories are for Minecraft (the PC/Mac edition), Minecraft Pocket Edition, Minecraft Console Edition, Minecraft Realms, and Scrolls. There is no Apple TV option, and once you start the bug submission process, there’s no way to indicate Apple TV as the platform except in the text of the bug report. Once again, you have to choose a specific iPhone model (or something else that isn’t an Apple TV) and then let Mojang know in the body of the report text that you are really reporting an issue on the Apple TV version of their game. 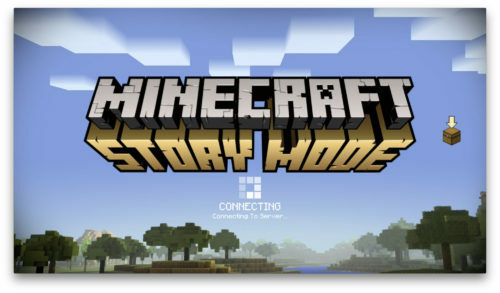 This lack of concern about details doesn’t necessarily mean that Mojang is going to let Minecraft on Apple TV wither (see what I did there) on the vine like TellTale has with Minecraft Story Mode. Minecraft on Apple TV is the same version as Minecraft PE on iOS, minus a couple features that they promise are coming soon, and I think they did that intentionally to keep them synchronized. It is a separate purchase, so technically they could abandon it while progressing development of the iPhone and iPad app, but I’m semi-confident that won’t happen. Still, development cycles may differ, as indicated by the fact that Mojang released an update for Minecraft on iPhone and iPad yesterday, but not for Minecraft on Apple TV. I’m not sure if I’m a fan of that. I’m really curious as to whether or not Apple will ever reveal any data about Apple TV App Store game sales. My strong suspicion is that game developers don’t make a lot of money on it. Indeed, I can’t imagine it being worth putting a game on Apple TV that isn’t also on iOS (meaning iPhone and/or iPad), and most of the good games that have come out recently are indeed on both platforms. 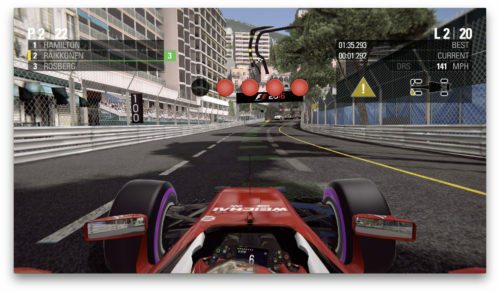 One recent addition the App Store for both iPhone/iPad and Apple TV is the mobile version of F1 2016, but sadly game controllers are optional rather than required on the Apple TV version. This means the game is probably not as good as it could be on Apple TV because they could do more realistic handling physics and allow for manually controlled gear changes if they knew players had a controller in their hands. I actually enjoy playing this on the iPhone more than on the Apple TV because Codemasters nailed their implementation of tilt-to-steer, which is usually quite terrible in most iOS driving games. However, this doesn’t translate as well to the Apple TV remote, which is too small and too fiddly for satisfying gameplay of this kind. You’d think that a proper game controller would be the best option for this game, but in fact it’s almost impossible on tracks like Monaco. I have a far better chance of not hitting the barrier playing on the iPhone with tilt steering compared to the Apple TV with our steelseries Nimbus controller, which I find pretty disappointing. It’s actually easier to corner in F1 2016 on iPhone than on Apple TV with a controller. That’s not good news for Apple TV gamers. F1 2016 exemplifies both the hope and despair that is gaming on the Apple TV – it’s good news that it’s there, but it’s compromised compared to the console version. The very fact that Codemasters considers the Apple TV version to be a mobile game rather than a console game isn’t a great sign. 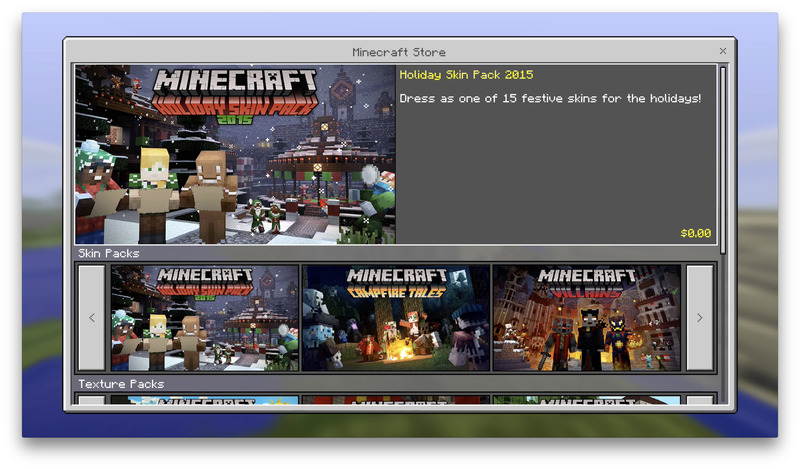 And truthfully, that’s how Mojang and TellTale games treat their respective Apple TV Minecraft titles as well. 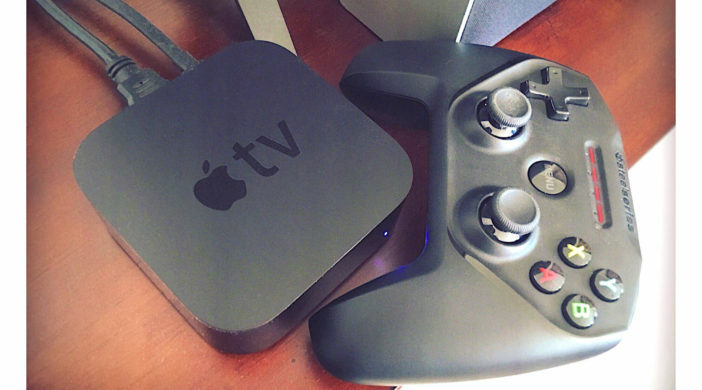 Apple still has the ability to fulfill the promise of Apple TV as a gaming platform. It requires them to engage with developers and encourage them to fully support their Apple TV games and to take the platform seriously and treat game buyers respectfully. It also requires Apple to promote the Apple TV heavily and cultivate a popular notion of the platform as a true gaming console. It’s doable. The question is whether or not Apple really cares enough to make it happen.